Rogue Women Writers: HALLOWEEN - WHY? their ghosts were still able to mingle with the living just before finally departing. It is said that the ancient Gaels were afraid that some of the diseased might come back to life and create all sorts of havoc like damaging their crops. And so they wore costumes and masks to ward them off. For centuries, children did the same at that time of the year. In trying to prove a direct connection between their Samhain and our Halloween (which was tough - I mean 2,000 years is a heck of a long time to connect the dots as we say) many scholars believed that since All Saints' Day (or all Hallows' Mass, celebrated on November 1) were so close together - they were combined into the celebration we now call Halloween (or All Hallows' Eve). In any event, these "festival" traditions continued through the Middle Ages all over Europe where poor people went door to door on Nov. 1 to receive food in exchange for saying prayers for the dead. (It was called "souling") In fact, Shakespeare mentions the custom in The Two Gentlemen of Verona (1593) when Speed accuses his master of "pulling (meaning whining) like a beggar at Hallowmas." It turns out that Irish and Scottish immigrants carried some of these traditions to America in the late 19th century when children played tricks on October 31st. But actual Trick-or-Treating didn't really get started in the United States until around World War II (though it kind of stalled in 1942 when we had sugar rationing). 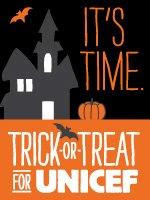 The whole Halloween idea finally received national attention when the children's magazine Jack and Jill, wrote about it and we had network radio programs like the Jack Benny Show and Ozzie and Harriet who encouraged children to collect coins for UNICEF instead of candy for themselves. At that point, Walt Disney got into the act, and what child could resist getting dressed up and "becoming" their very favorite cartoon character -- or Superman, a fairy princess, or even one of those images of the dead -- harking back many centuries. So here we are, celebrating a tradition begun, as many believe, some 2,000 years ago....one that has evolved from a festival where the ancients wanted to ward off souls who might TAKE the harvest of crops to an evening where contemporaries want to answer the doorbell and GIVE out a harvest of goodies to adorable costumed children. Fascinating, Karna. I never knew the history of Halloween. I do recall my Dad mentioning something about kids in pre-WWII days playing tricks around town and it being a kind of rough holiday, but I didn't know the rest. Maybe the trick or treating was an attempt to civilize the holiday. Anyway, thank you for an interesting and information post. Appreciate your comment, S. Lee - I remember when I went Trick or Treating SO many years ago, there was a sweet elderly couple down the block -- and whenever we rang their bell, they would invite us in and say that we had to perform a trick, then we would get a treat. Seemed only fair -- so we all dutifully tried to sing a song, do a little dance or maybe recite a rhyme. Looking back I realize how happy they were to be "entertained" by so many children on that special night! I'm loving your blog. But I must add my voice to the previous two commenters. 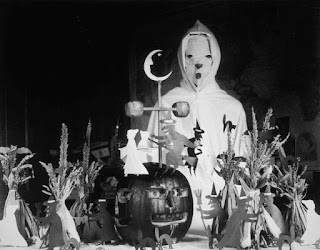 My dad, born in 1903, told about the trick part of trick or treating (well before WWII). They cut notches in a wooden spool (used by sewers), rolled a length of cord around it, then, holding the spool by a stick through the center, put the spool against a window and yanked the cord. Homemade noise maker. Love the spool trick above! And I had no idea of the history of Halloween. 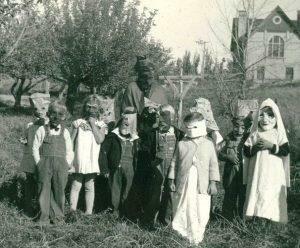 And why are those older photos of Halloween costumes so much more scary than the costumes of today? Reminded me of the old "corn man" stories we told as kids about a man who chased kids through the corn fields. Karna, what a wonderful history of Halloween! 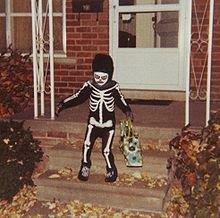 And I adore that little skeleton!